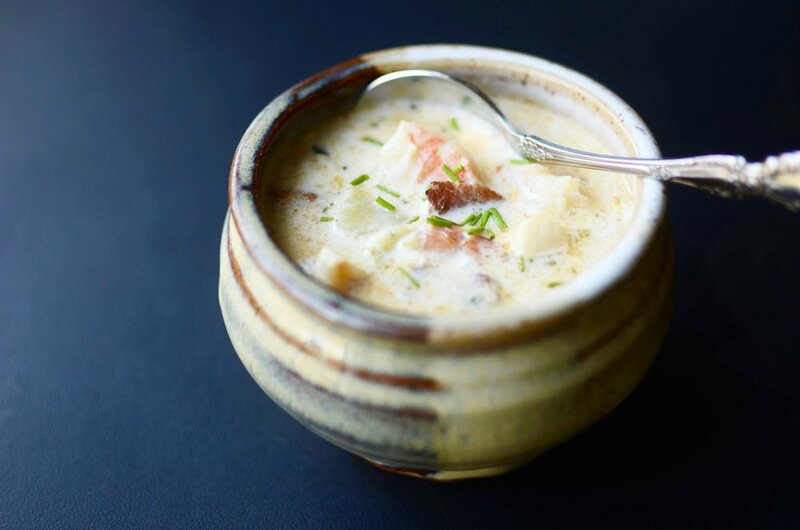 You might be thinking, “what’s Maine chowder?” In short, it’s a brothier version of the more traditional New England-style chowder, which is often thickened with flour. This chowder starts with a flavorful shrimp stock, but it’s thickened with a flavorful heavy cream reduction. Chock full of tender shrimp and bay scallops, this luxurious soup is guaranteed to please the seafood lovers in your life. Start by carefully cooking the shrimp until it’s just barely cooked through. Here I’m using shrimp that still have their shells, but you can use peeled shrimp if that’s what you have. I like to cook them in the oven, like this. When the shrimp are cool enough to handle, remove the shells/tails and cut the shrimp into bite-size pieces; set aside. Freeze the shells/tails to make shrimp stock at a later time. In a large dutch oven or braiser (I use one like this), sauté the bacon until it starts to render some of its fat, then add the leeks and potatoes to the bacon and continue sautéing for about 5 minutes. Add the shrimp stock and bring to a boil; cook until the potatoes are tender, then turn off the burner. In a large skillet, cook the bay scallops in butter just until they’re barely cooked through. Be careful not overcook the scallops or they’ll turn rubbery. Add the cream, reserved shrimp, and any juices that may have collected on the roasting pan. Add the parsley and cayenne; stir well and heat until the cream starts to bubble. Skim the shrimp and scallops from the cream and set aside while the cream reduces. Allow the cream to boil until it reduces in volume and thickens. Add the thickened cream to the shrimp stock. Stir in the reserved shrimp, scallops, and optional dry sherry. Stir well to combine. Taste and adjust seasoning with salt and pepper if necessary. Cook shrimp until just barely done (directions here). Add the shrimp stock and bring to a boil; cook until the potatoes are tender, then turn off the heat. In a large skillet, cook the bay scallops in butter just until they’re barely cooked through. Add the cream and reserved shrimp to the skillet, along with any juices that collected in the baking pan. Add the parsley and cayenne pepper and heat just until the cream starts to bubble around the edges of the pan. Skim the shrimp and bay scallops from the cream; set aside. Allow the cream to bubble away until it reduces a bit and thickens. Pour the reduced cream into the shrimp stock and add the reserved shrimp and scallops; stir well and serve. I found the most amazing blackberries at the market the other day - they were super sweet and delicious and I couldn't wait to use them to make Blackberry Fool, an incredibly simple, yet elegant dessert. In case you're wondering, fruit fool recipes first started appearing in the year 1598 - the word fool is thought to be derived from the french word "fouler" which means to press or mash. When choosing blackberries, pick ones that are completely black, and taste them to make sure they're sweet because they won't ripen after being picked. To make blackberry puree, place ripe blackberries and lemon zest in a personal blender or small food processor. Blitz the berries until completely pulverized. Then pass the puree through a fine mesh strainer to remove the seeds. A silicone scraper is pretty helpful here. Blackberries contain a LOT of seeds so you definitely want to remove them (discard them or feed them to the chickens). Mmmm.... smooth, seedless blackberry puree. To make blackberry fool, fold together 1 part blackberry puree and 4 parts sweetened whipped cream (recipe below). You can leave the mixture a little streaky if you like - I think the streaks look kind of cool. Or if you're a bit compulsive and you can't help but continue to fold the two components together until they're completely mixed, go for it. You do you. Spoon or pipe the mixture into dessert cups. The dessert cups I chose (these) have very small openings so I filled them using a pastry bag to keep the cups neat and clean. To complete the presentation, pipe some leftover whipped cream on top using a large closed star tip (like this one) and garnished with a mint leaf. Enjoy! Make berry puree by blitzing berries with lemon zest in a personal blender or small food processor; strain seeds and discard. In a small mixing bowl, whip heavy cream, sugar, and vanilla using a handheld mixer until stiff peaks form. In another small mixing bowl, fold together 6 tablespoons strained blackberry puree and 1 1/2 cups of sweetened whipped cream until combined (a few streaks remaining look lovely). To neatly fill dessert cups, transfer berry and cream mixture to a piping bag and carefully fill six 3-ounce mini dessert cups (eight dessert cups if you don't fill them as full). Place remaining whipped cream in another piping bag filled with a closed star tip and top each dessert. Garnish with a mint leaf and/or a drizzle of the remaining blackberry puree. Note: the blackberries can be substituted with other seasonal berries.